Are you ready for something a littttle bit spooky? Only on Pizzazzerie will you get a DIY for personalized satin ribbon for luxe gifting and then spiders coming out of a cake. What? I know. I debated sharing this one because it’s a bit creepy and wierd but you know what, I love it. And I think all 6 year old boys across the country will side with me. So here we have it. This idea was born from the surprise confetti cakes that have been popping up everywhere the past few years. Similar…accept way creepier! 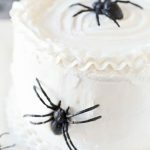 This spider cake is perfect for Halloween! Truly though, slice into this Halloween cake and out come a lot of spiders. What do you call a group of spiders? A flock? A gander? A herd? Completely creepy is what you call them. Wait until you see the faces when they see these come pouring onto the cake stand. Have you seen the ring spiders on top of cupcakes at grocery store bakeries before? Ring spiders would be cute inside of this too. Spooky, yes, but still cute in my opinion! So how do you get the spiders (or Halloween candy for those that are totally creeped out), I’ve put step by step pictures and directions below! For the purposes of this “recipe”, I’ve used a simple white cake and vanilla frosting. The idea here is the spider part so you can use any cake and frosting combo that your heart desires. I do recommend a lighter cake color just so that the spiders will contrast. Don’t worry chocoholics, you can put chocolate frosting on it if you’d like! 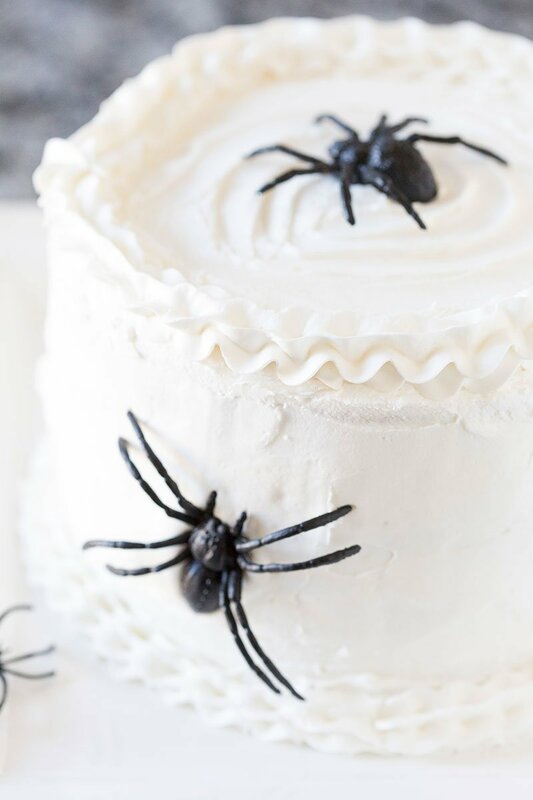 Spook your family with this Surprise Spider Cake for Halloween! Bake your cake into 2 rounds (I used 8 inch rounds). After cooling, slice each cake round into two layers. Stack three of your four layers and use a knife to carefully cut out a hole in the center (about 2 1/2 inches wide). Remove that cake portion leaving an open hole. Separate your cake layers once again and frost between them. Stack again, frosting between each layer. Finish with the fully round (no hole in the middle) fourth layer. Cover with frosting and decorate with extra spiders! Too scary? Like I said, use the idea and put your own twist on it! Candy corn surprise cake would be super cute and very non-spooky. Or even a variety of leftover Halloween candy. Can you imagine cutting into a cake and out pours mini candy bars? I think that is what heaven will be like. Might have to try that one! 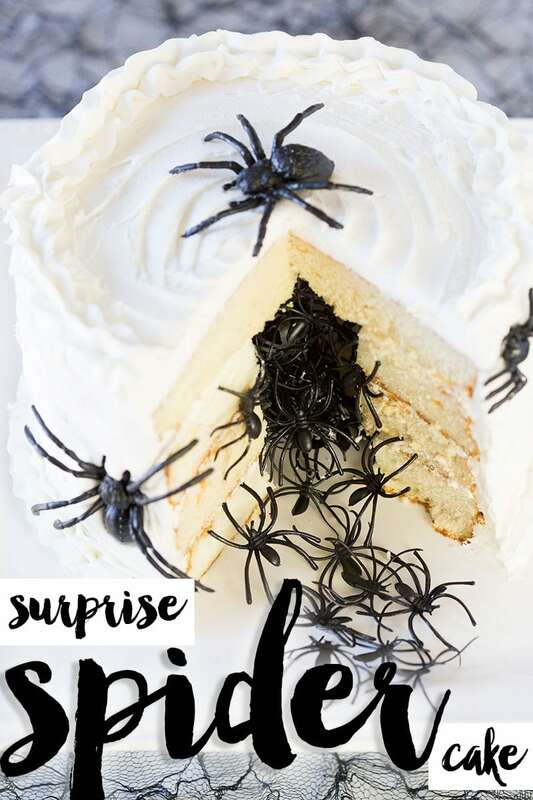 Meanwhile, I hope you try this spider surprise cake for Halloween! This is such a great idea. Super spooky, but I agree boys would love it. This is so creepily awesome! This is so cute! Perfect for the party we’re having this year! I’m going to surprise my kids with this. It’s taking everything I’ve got not to send the link to my arachnophobic sister. HAHA! :) Hope your kids love it! That’s our plan! Daughters bday is on April 1st and she hates spiders! Ha!ha! Awesome cake!!! Are the spiders edible. If not where did you buy these spiders. Hi! They’re spiders from the craft store that were out around Halloween. I love it, You go girl. I would like to make this for Halloween. Has anyone actually made this cake. I was just concerned if the top layer sags or falls in without anything to support it. Stacy, if you make that top finishing layer (that is solid) thick enough, or at least not a flimsy one, then it will be fine! This is such an awesome idea. You are a genius. Awesome cake! I’m on desserts for a Halloween party so this is perfect! I’m just going to use case mix. Do you think I would need two boxes? Can I make this the night before my Halloween party or do I need to make it the day of the party? You can make it the night before! for Halloween. Thanks for the idea. How much does cutting each layer in half add to the messiness fact with crumbs? Would it be easier to just bake 4 layers and not cut them in half? What about baking a flat cake using bake even strips and/or pushing down on the dome when done cooking? I just had to google bake easy strips and realised that I do this already by tying strips if wet cloth around my pans. Lol! I suppose you could do those things but i think it would be much less fiddly to just cut your layers with a knife ??? ?